My sincere apologies for the lateness of this post, and because this may well be the only post I get out this week. However, it should tidy up the card reading series and it comes with photo illustrations, so that’s exciting, right? I’m sure other people have other methods, but these are the ones I work with so I’ll be explaining from my point of view only. Before you do any spread, contact spirit(s) if you like. If you don’t know how to do that or don’t feel like that will help your reading, you can bypass this step. 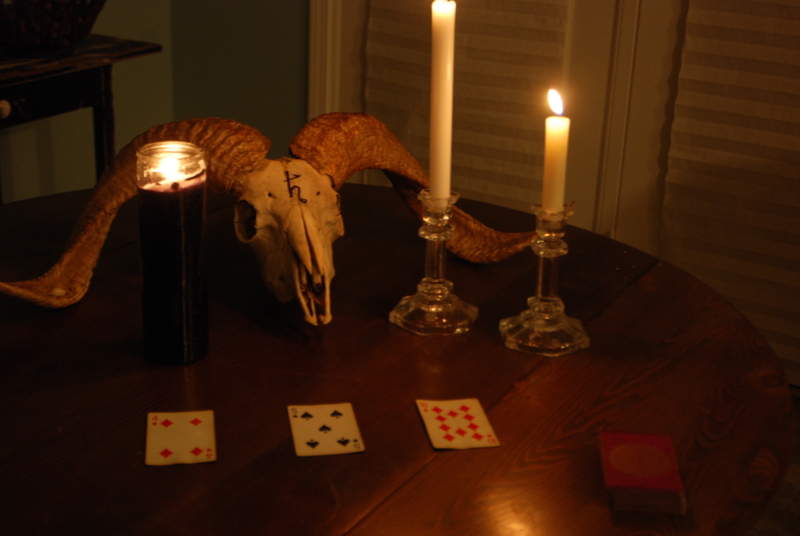 In the illustrations below, you’ll be seeing candles and a ram’s skull in the picture. While these are a part of my Ancestral contact work, I’d like to be up front in saying they are in these pictures more for show than anything else. 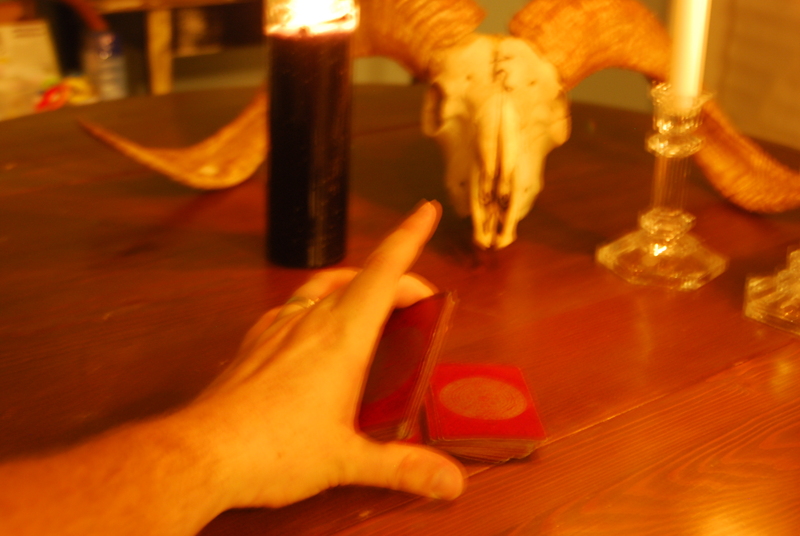 I do sometimes contact Ancestors via the cards (mostly because my cards are handed down from my mother, so if I want to speak to her they’re a great medium for that), but generally speaking I don’t have a lot of paraphernalia during a cartomancy session. 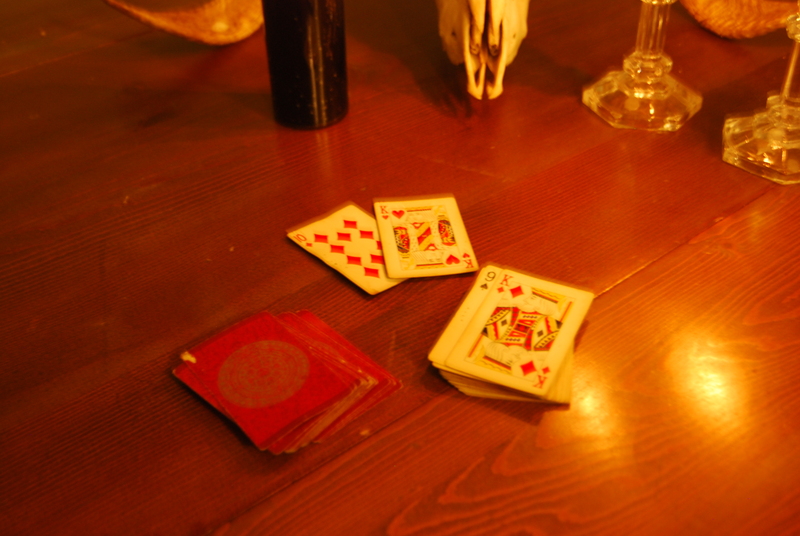 Part of the charm of reading with playing cards is their ubiquitous and unassuming nature, so getting all the trappings and trimmings of a full Ancestor contact working out is a bit overkill. But it looks nice in pictures. 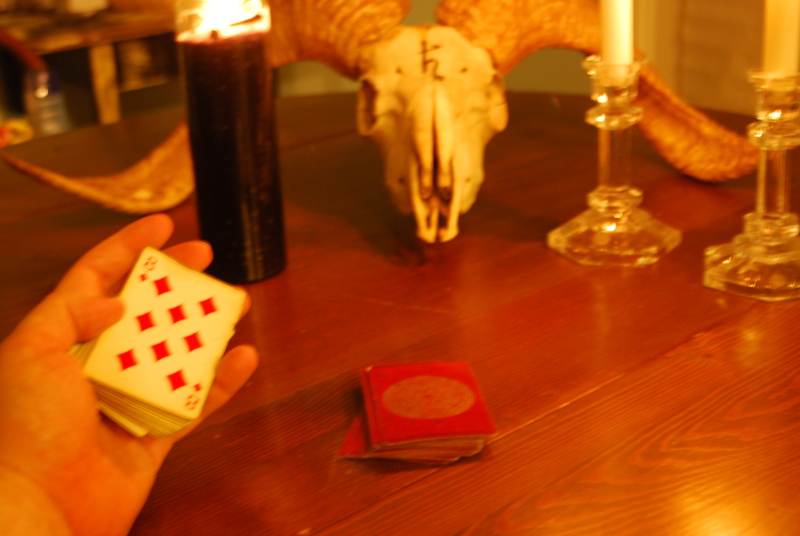 Often, a short prayer to the effect of “Spirit(s), guide my hands as I shuffle these cards, my eyes as I read them, and my mind as I speak their meaning” will suffice. A glass of water and maybe a candle will add to it, if you are so inclined. But don’t feel compelled to twist yourself into knots before you’ve even begun. This is the simplest kind of reading, and can be done in a minute or two. 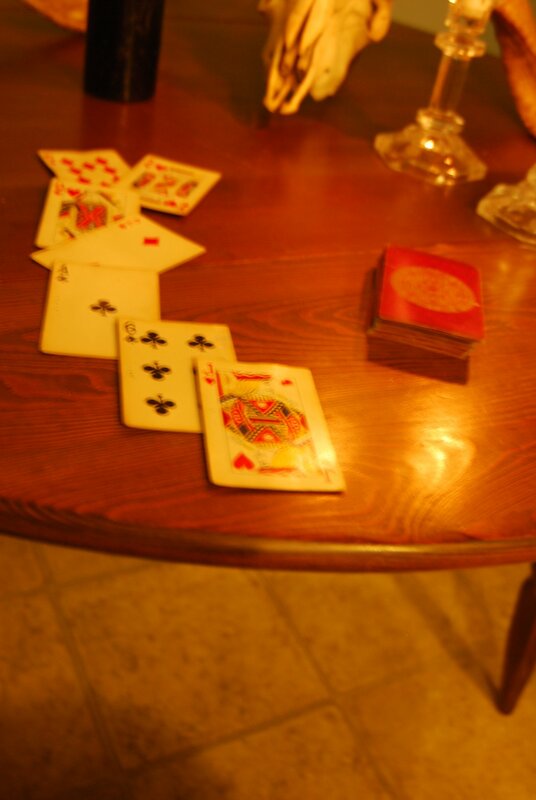 The questioner posits a yes/no query, and the reader cuts the deck and shows the card at the split (see Fig. 1). If it’s a red card, the answer is “yes,” and a black card means “no.” The actual card itself can add a little more meaning to the reading, if you care to discuss it with the client, but it won’t tell you much. 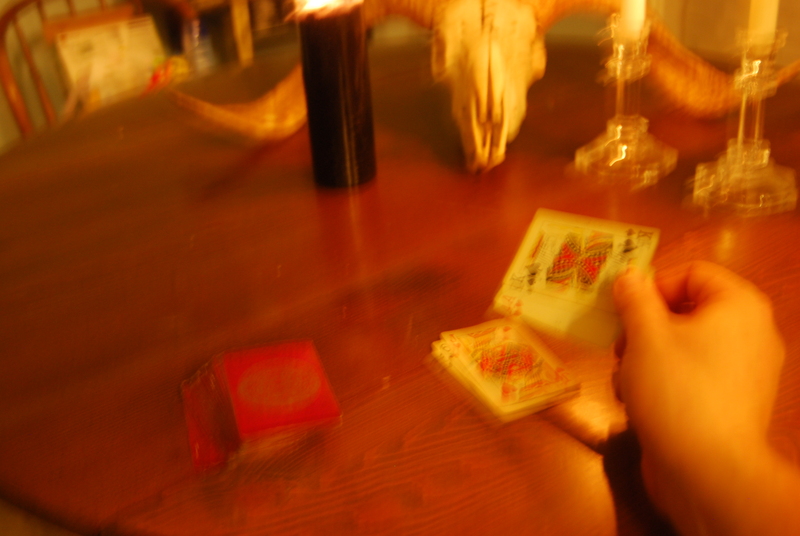 For instance, in the photo, I’ve got the Eight of Diamonds. So if the querent asked something like “Will I meet a new romantic partner soon?” the answer would be “yes,” with a slight augmentation indicating that perhaps they will meet their lover due to some office gossip, or that perhaps their new paramour will be a gossip him/herself. This type of reading is not particularly good for deep questions. The new love question probably is about as profound as it can get with such a cursory effort. This sort of spread is a little fuller, but it is usually linked to a period of time. Make sure to establish that time-frame before doing the reading, asking the cards to show you yesterday/today/tomorrow, tomorrow morning/noon/night, etc. You can be very vague and say past/present/future, but the answers will likely be equally vague. You can also be very specific and say 1pm/2pm/3pm, but that may also short-circuit the reading. I generally find morning/noon/night readings are my favorites with this type of spread. In fact, I often do them in the evenings as part of staying in practice. They take about 5-10 minutes and they help me to pay attention to different things throughout the day. Morning – Four of Diamonds: The purse/money bag; No news. 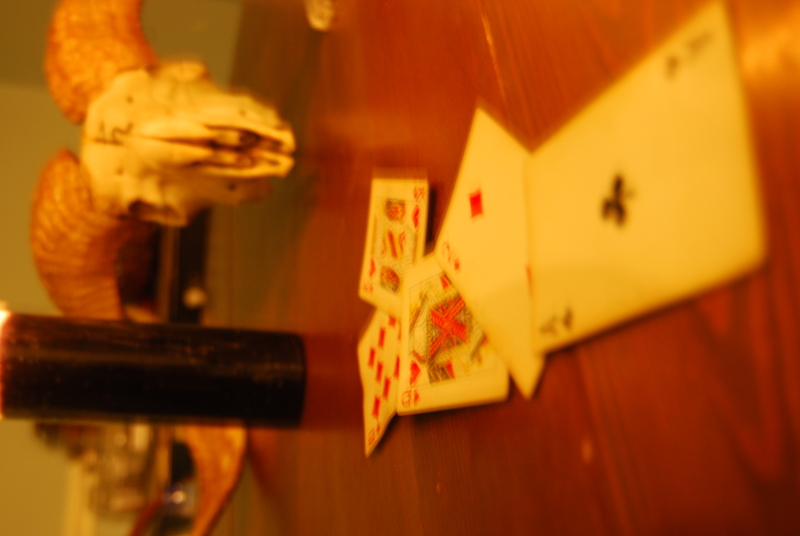 Noon – Five of Spades: Illness; A corpse. Night – Ten of Diamonds: A treasure chest; Sunlight; Joy. So for this particular reading, the morning would be fairly stagnant, especially financially. As the day progressed, things would feel like they were getting worse, or perhaps some real effort would be needed to “bury” those monetary woes. But by the end of the day, everything’s working out, and finances are secure. So perhaps the client will have a money scare (an overdraft charge or something like that) which they spend a good bit of time dealing with, but by the end of the day, it all works out in their favor. Or, it could be that the actual workday (assuming a 9-to-5 schedule) will be awful, going from bad to worse, but that the evening will redeem the day, perhaps by allowing some small luxury time with friends or loved ones. This is the reading most people want, and the most detailed one I personally give (there is another type of reading where you spread out almost every card before you’re done, but I find that to be excessive, so I’ve never worked with it). 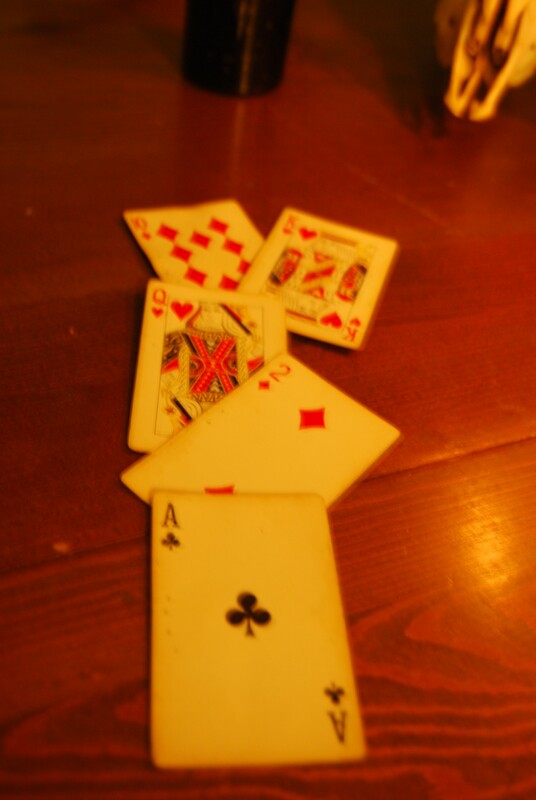 It’s called a five-card spread because in its basic completed form, five cards are displayed (as in Fig. 3). I mentioned, though, that this is a misnomer. In fact, you’ll actually read at least seven cards in this layout, with the potential for several more on top of that. 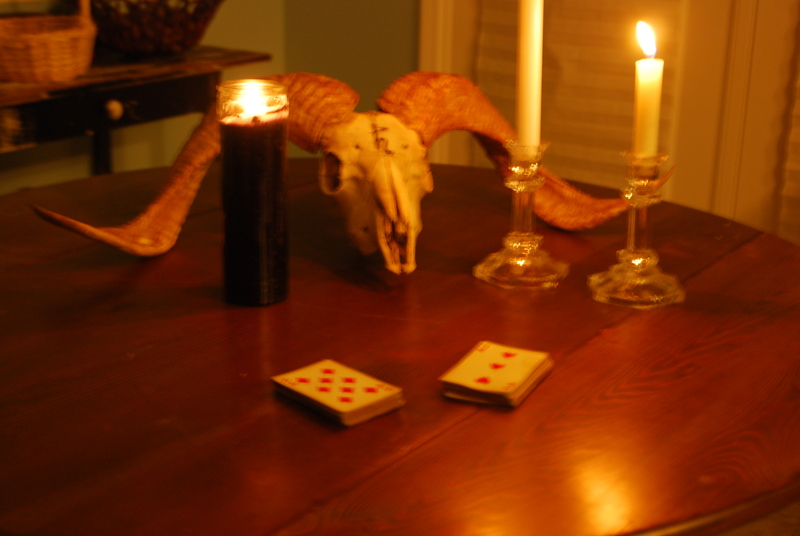 I start by “clearing” the deck, which is just a highly ritualized shuffle while I attempt to keep my mind blank in order to “neutralize” the cards for the client. Then, I let the client shuffle the cards while asking and focusing on his or her question. Queries here can be as simple or complex as the subject wants. I know there are folks who do not like others touching their cards, so if you’re not comfortable with that, feel free to just hold hands with the client before shuffling the deck yourself. That should at least allow you to get a bit of the client into the cards for the reading. Once the client feels the deck has been shuffled enough (or you, if you do it that way), stop and stack the deck into a single pile. Then the client (or you) will cut the deck (Fig. 4) and put the top half of the pile facing up on the reader’s left. 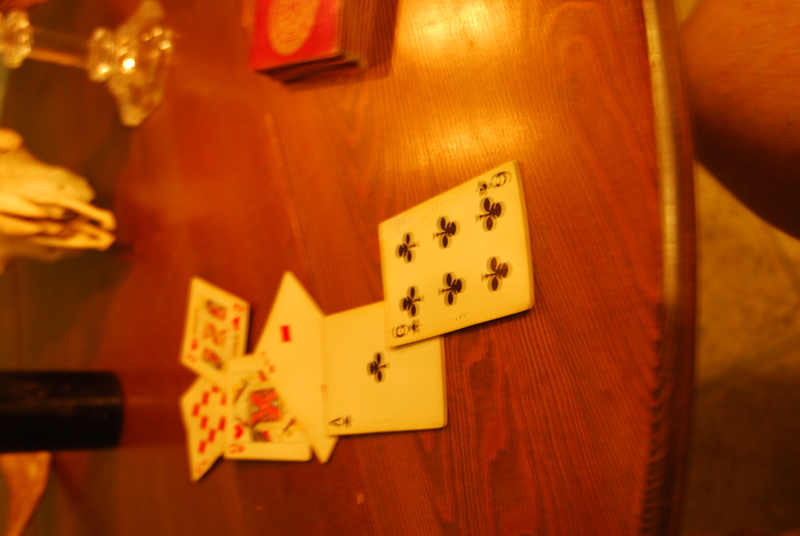 The bottom half is flipped over so that the bottom card is face up on the reader’s right (Fig. 5). This is the “quick read” of the situation, which will examine internal and external influences on the subject. Internal – Eight of Diamonds: Gossip; Idle chatter. External – Three of Hearts: A wish granted; A full cup. So the internal situation seems to be one of pleasant, if light, emotional content. The external component says that the cup is full, and all is well. Basically the cards indicate an extremely happy if rather casual romantic relationship. Card 1 – Queen of Hearts: Soulmate. Card 2 – Two of Diamonds: Birds (as in “a little birdie told me”); Exchange of funds. Card 3 – Ace of Clubs: A cave; Solitary contemplation. 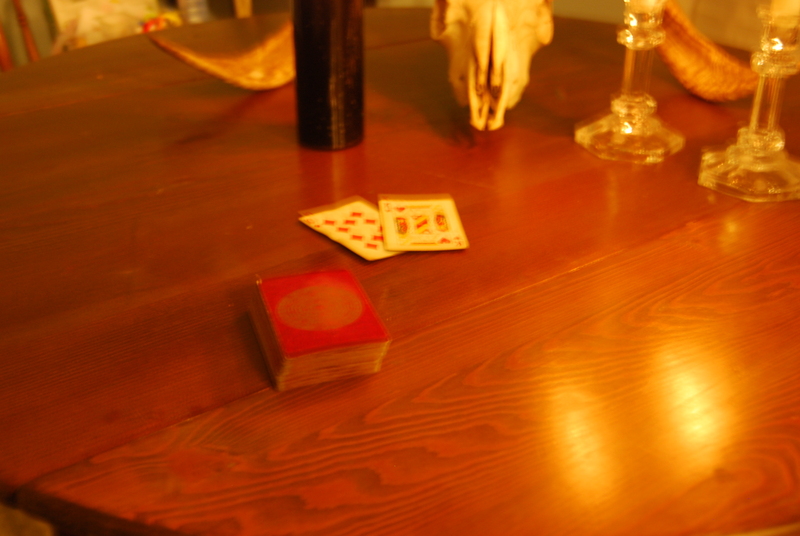 First, I note that there are no spades, which indicate a relatively positive reading. Second, the soulmate card appears almost immediately, which is a very good sign in a question about relationships. The reader already knows that the signifier card is surrounded by good things (the interior sunshine and the near future or current soulmate). Next down the list is the birds card. This might mean getting some good news about the soulmate, or possibly even something more significant (think “birds and bees”). It could theoretically mean an exchange of funds for love (an expensive date, or possibly prostitution), but there’s not much to support that in the reading otherwise. The third card is a little bit more difficult, as it indicates a need for personal space. So it may indicate that while things are going great now, something is going to take the relationship to the next level (the birds and their associated nesting), and that the subject will feel the need for his own space or time. Conversely, a cave is also the most rudimentary form of home, so it could mean that the subject will be doing his own version of “nesting” soon. All in all, this could mean moving in together, or possibly even starting a family together, sometime in the near future. The reading can stop here, if the client and/or reader wishes, or cards can be pulled one at a time randomly from the remaining deck. In this “extended” spread, the meanings become vaguer and vaguer as you go further out. Generally speaking, I will only allow 2-3 extra cards during my readings, because after that things just start falling apart. In Fig. 11, you can see I pulled the Six of Clubs. That is the card for “Footprints; A clear trail.” This basically just reinforces the current trajectory of the relationship, and for someone who’s already started a family or moved in with their significant other, probably just means “stay the course.” The current homelife is rich and rewarding, and will continue to be so. Just to tie everything up, one more card is pulled (Fig. 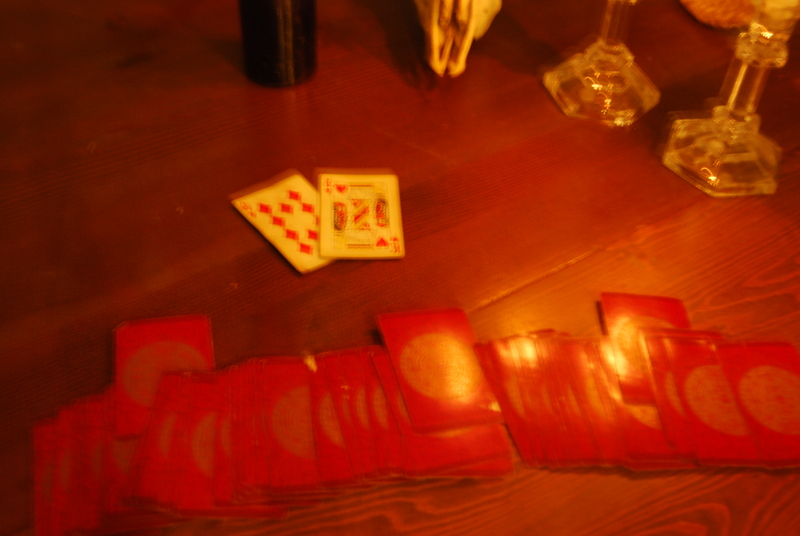 12), the Jack of Hearts. This is the card signifying “A baby; A cradle; A young boy.” If I weren’t the client, I imagine whoever I was reading for would probably get beads of sweat on his neck right about now. All indications are that the natural ending to all this domestic and romantic bliss will be a bouncing baby not too far down the line. It’s a tidy ending to a very positive reading, and a good place to stop. I hope that illustrates these basic card layouts for you. My apologies if the photos aren’t great, but hopefully you get the idea. If you have any questions, please feel free to ask. I reiterate that this is my own system, based on several I’ve encountered and worked with over time. I’m happy for folks to use it, though if you quote it or share it with others, please attribute it to me. Oh, and while I didn’t actually focus on anything during this reading, it’s eerily accurate. My wife and I are now expecting baby #2 sometime in March! Woo hoo! This entry was posted on September 8, 2010 at 11:30 am and is filed under Blog, Practice & Technique. You can subscribe via RSS 2.0 feed to this post's comments. Another great post, but most importantly congrats on the expectant little one! As a father myself, it gives me hope to see there is someone else out there who can manage an active family life and advance their Witchcraft as well. Many congrats! I’m glad you all liked the cartomancy series, too! It was a lot of fun for me and it’s something I really enjoy. All the best, and many thanks again! Congrats on the new baby news! I have a deep love for all card magic, so all of these card-related posts have really been fascinating to me. Thank you so muck for posting them! And congratulations on baby #2!